Who Made America? 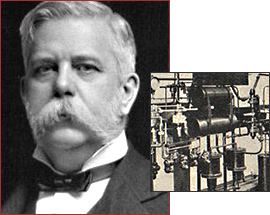 | Innovators | George Westinghouse, Jr.
Westinghouse designed the first illuminated tennis court, lit by 1,500 bulbs. A tireless inventor and businessman, Westinghouse designed an air brake that made rail travel safer, and his promotion of an alternating current system revolutionized the power industry. George Westinghouse was instrumental in increasing the safety of the American railroad system and encouraging the growth of the transportation industry. He was born in Central Bridge, New York, in 1846. With access to his father's machinery shop, Westinghouse developed a fascination with steam engines. Though his experiments were interrupted by the Civil War, in which he served with the Union army, Westinghouse promptly returned to his father's business after the war ended. His time in the army made him realize the importance of railroads to the national project of industrialization. Perceiving that increased safety on this new system of transportation was necessary for further development, Westinghouse invented and patented a compressed-air brake system in 1869 to replace the standard manual braking system, which was often faulty. He incorporated the Westinghouse Air Brake Company, the first of more than 60 companies he would form to market his and others' inventions. The 1893 Railroad Safety Appliance Act made air brakes compulsory on all American trains. In total Westinghouse made over 300 inventions that revolved around railroad travel, including a rotary steam engine, an effective means of righting cars that had been derailed, and a "frog," a switch that allowed trains to "hop" across rails at a junction. In 1883 he applied his knowledge of air brakes to the safe piping of natural gas, and within two years he obtained 38 patents for piping equipment. Westinghouse also experimented with electricity and developed a transformer that could bring alternating current (AC) electricity down from high voltage to low -- thus enabling AC to travel long distances while still making it ready for use. He purchased Nikola Tesla's patents and hired him to improve his AC motor for use in Westinghouse's new power system. Westinghouse formed Westinghouse Electric in 1886 to compete with Thomas Edison's direct current (DC) system. Advocates of DC power set out to discredit AC power, charging that the use of AC power was a menace to human life and publicizing New York state's use of the Westinghouse AC generator as its official means of execution. Westinghouse and Edison waged an ongoing court battle over electricity known as The Seven Years War. In 1893 Westinghouse proved AC's safety when his company lit the World's Columbian Exposition in Chicago. Soon after Westinghouse secured the rights to develop Niagara Falls, creating the first large system to supply electricity for multiple uses (railway, lighting, power) from one circuit. His businesses flourished until 1907, when a financial panic caused him to lose control of his companies. By 1911 he had severed all ties to them and his health began to fail. Westinghouse died in 1914, ending one of the most prolific careers in American invention.